Guatemala has issued a formal letter of protest to Belize with reference to a trip to the Sarstoon last Friday. Tonight, we can say that Guatemalan Ambassador to Belize Manuel Roldan has outrightly disputed our version of events. Just for some clarity, on Friday morning News Five attempted to go down the Northern Channel of the Sarstoon River. 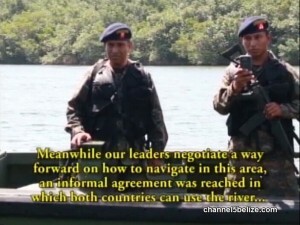 We were testing the validity of a so-called informal agreement coming out of the Istanbul talks, in which Belizeans would be able to access our portion of the Sarstoon unhindered. We’d say that it’s been proven that the agreement wasn’t worth the paper it was written on, but that’s the thing – there’s nothing in writing. We were stopped by Guatemalan military who informed us that we were in their national waters and would have to leave immediately. When we told them about the informal agreement coming out of Istanbul, they didn’t seem to know anything about it. So that was that, captured on crystal clear video footage – stopped by the GAF in the Northern Channel of the Sarstoon, well within Belizean territory. But as we told you earlier, Guatemalan Ambassador Roldan has a different version. He claims that we actually went over to the Guatemalan military base asking for permission to go into the Sarstoon. He says they told us that we would have to get permission from their headquarters in Livingston and we then left, end of story. Today we tried to reach Belize’s Ambassador to Guatemala Alexis Rosado for comment, but he was unavailable. We also tried to reach Ministry of Foreign Affairs C.E.O. Lawrence Sylvester for comment, with no success. Late this evening a source from the Ministry of National Security informed us that Belize has in fact already issued a very strong protest note, with a request directly to the O.A.S. Secretary-General Luis Almagro for intervention. Very good Channel 5. These Guats, from their military to their diplomats, have the audacity!!! They have no shame!! Next time, Channel 5, take a 360 view of the location, so they won’t even be able to dispute anything. The geography doesn’t lie. El río Sarstún es territorio de Guatemala, el tratado de 1859, no le otorga a Belice derecho de navegación y menos soberanía sobre alguna parte del río Sarstún, el artículo 1 del tratado de 1859, establece que el límite sur de Belice, es el río Sarstún, entiéndase es limite únicamente de Belice, por lo tanto el río Sarstún es territorio de Guatemala. Los piratas beliceños siguiendo el ejemplo del amo continúan haciendo incursiones en territorio guatemalteco con fines de apoderamiento. pablo huinil…. you, sir, are a swine… Belize is an independent country. It has been since 1981. Guatemala decided that our land was of no use to them, Oh! but now that they see us growing and can take care of ourselves, now they want us back huh. Well that won’t be possible because we will fight or what is ours. Channel 5, kudos to you for exposing and informing!